Sunday night’s Game Seven NBA Finals contest between the victorious Cleveland Cavaliers and last year’s NBA champions the Golden State Warriors enjoyed the highest-rated sports telecast on ABC or ESPN in a decade. The game, in which the Cavs defeated the Warriors 93-89 and determined who would be the league champion, also proved to be the highest rated NBA broadcast for ABC ever. 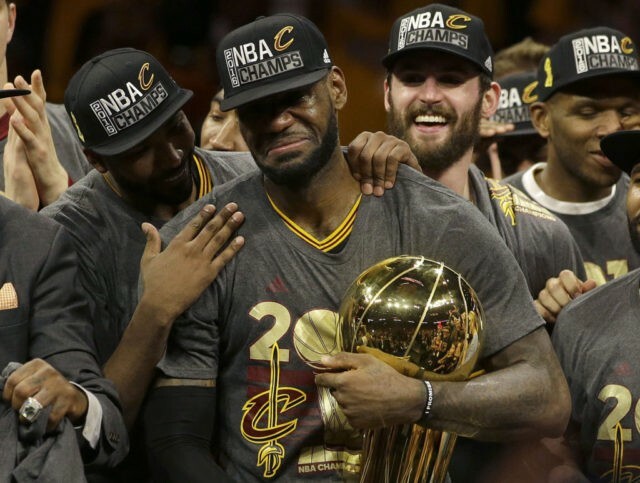 Powered by the NBA Finals MVP LeBron James, the Cavs brought the first major sports championship to the “Forest City” in 52 years. In 1964 Jim Brown spearheaded the Cleveland Browns’ triumphant NFL championship game over the heavily favored Johnny Unitas-led Baltimore Colts. Sunday night’s game was up 7% from the last NBA Finals Game Seven, when Miami Heat took on the San Antonio Spurs in 2013 and drew a 17.7 overnight rating. It also exceeded the previous all-time seventh-game leader, the contest between the Los Angeles Lakers and Boston Celtics in 2010, which drew an 18.2 overnight rating. Variety reported Sunday night’s contest earned a stunning 18.9 metered market ratings, according to early Nielsen estimates. To see updates of the ratings report click here.